The company was feeling proud to introduce this phone to the market. There are various special things about it which make it better, smoother and most price worthy device till now. The smartphone is the most worthy and particular one by the Micromax till now. There was no sign of the device before this. The company has announced, released and available the smartphone for the customers in a very little time. Regarding specifications, this new Canvas Unite 4 has a 5.0 inch IPS LCD capacitive touchscreen with 16M colors. It has the resolution of 720 x 1280 pixels with about 294 PPI pixel density. The phone is protected by Corning Gorilla Glass 3 protection. The display supports Multi-touch also. The company is powering it by a 64-bit class 1 GHz MediaTek MT6735P quad-core processor. The smartphone will have the 2 GB of RAM. The internal memory of the device is 16 GB which can be extended up to 64 GB via microSD card. The primary camera of the phone is an 8.0-megapixel camera with auto-focus, LED flash and HD recording @30fps. The front camera is 5.0-megapixels which are quite good for the selfie freaks with a LED flash. The primary camera features Geo-tagging also. The inbuilt OS of the device will be Android OS Marshmallow v6.0. 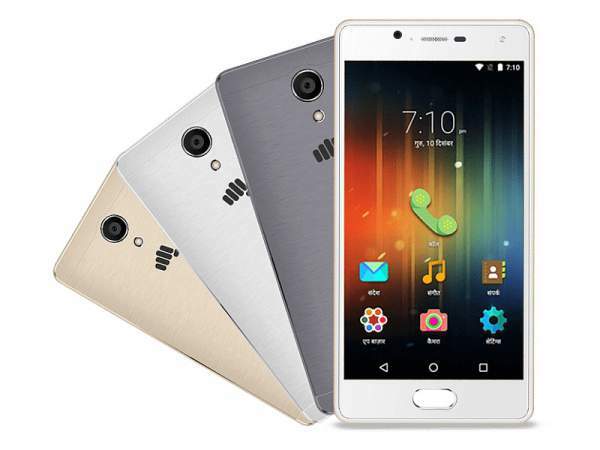 Micromax is powering the smartphone with a 2,500 mAh which will be non-removable. The talk time is about up to 20 hours. The standby time is close to 280 hours for the device. The company is making the device special by providing some add-ons to the phone. The device has same usual facilities like WiFi 802.11, Bluetooth v4.0, GPS, FM radio, microUSB v2.0. The device has some sensors which make it absolutely superb. It has Fingerprint sensor, accelerometer and proximity sensor. The smartphone has GSM/ HSPA/ LTE network technologies in it. This smartphone features system-wide support for 12 Indian regional languages with a powerful Indus OS v2.0. The special things about the phone are that it comes with hybrid keyboard, a Text-to-speech, and App Bazaar’s regional language marketplace. It is an effort in the successful expansion of the regional language devices all over the country. The company is estimating about 300 million orders for the first slot of the production. The device comes in different color variants. The company is providing the device in Champagne, Grey, and Silver color. The device is priced at Rs. 7,900. Next articleVikings Season 4 Episode 11 (S4E11) Air Date and Spoilers: Bjorn-Rollo Alliance and Introduction of Lagertha’s New Love?